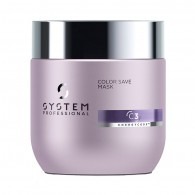 System Professional have spent 40 years working to develop a way of offering personalised haircare both in salon and at home. Scientists established that the energy profile in each of our hair decides elasticity, responsiveness and fibre health, and that this ‘energy fingerprint’ is decided by the lipid level within our hair. Lipids actively influence hair’s energy, despite only making up 4% of our hair. They act as a flexible bond between keratin, to ensure cuticle flexibility and integrity. With targeted doses of EnergyCode™ Complex, the new range of System Professional products address each unique energy profile with 2 ingredients targeting the scalp and 2 for the hair. Caffeine works to energise the roots whilst Vitamin B3 Amide rebalances moisture within the scalp. Lipids replenish cell cement on hair and reinforce hair strength, while Histidine protects and repairs hair’s natural protein structure.